Ever since Chef Jeremy Spector opened the Brindle Room in the good ole EVill, I’ve heard nothing but great things about their Burger. With a background in not only Comfort Foods but also Steak, one has to assume Jeremy has eaten a few Burgers in his life. 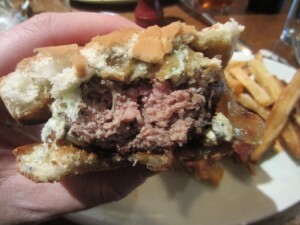 The rumors of his Dry Aged Beef Burger have come at me from every angle and recently thanks to my friend Nick’s perusal of daily deals, we knocked the Brindle Room off my “to eat” list. The East Village is a great place for local business. Due to a rich history of as a cultural community and the fact that the ground isn’t thick enough to construct tall buildings, the neighborhood has maintained a high level of great places to eat. Amongst them is the Brindle Room. Combining the best parts of an American Bistro, French Cuisine, Comfort Foods, Chef / Owner Jeremy Spector has put together a small plates / tasting menu like no other place. This cozy little gastro-eatery constantly receives rave reviews over their cuisine, most frequently, their Burger. Coupled with a small but unique list of Craft Beers, Wines by the bottle, Sake’s and Cocktails, the Brindle Room might be short of space but it’s unique on personality. After looking at the menus, there’s a lot of tasty reasons to check out the Brindle Room, with or with out a discount coupon. 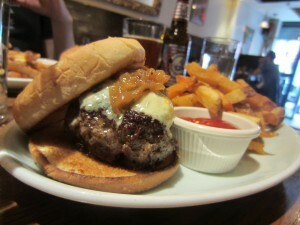 However, the Burger was entirely the reason for our visit, along with two Beers. 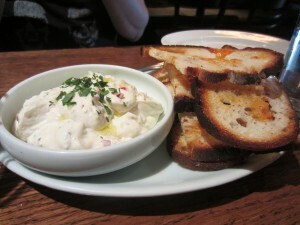 We started off by ordering an appetizer of Herbed goat cheese with Toasted Crostinis. ORDER THIS, I ORDER YOU. The Goat Cheese, warmed just enough, is like a fluffy cloud of savory tastiness with Herbs and Spices mixed in. With just a little heat from the Spices, this dish is not to be missed. In fact, I’d seriously consider going to the Brindle Room just to eat this! Made from Dry Aged Steak Trimmings, the Brindle Room Burger is served on a simple Toasted White Bun with a hearty stack of Caramelized Onions and your choice of Cheese. I was feeling extra funky this day and ordered mine with the Blue Cheese. Arguably, Dry Aged Beef doesn’t need an additional tangy element added to it like a stinky Cheese, but who says I have to eat by the rules? 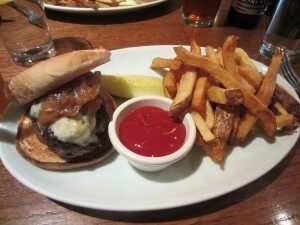 The Burger came with a a great char on the outside that really upped the salty taste quotient to the whole Sandwich. The onions balance out the Sodium with a nice Sweet Flavor while the Toasted Bun gives is all a very nice place to play. While it’s not the biggest, the Burger at the Brindle Room packs in a lot of rich flavor that will leave your lips smacking and your stomach satisfied. I love me some skin on French Fries but didn’t nearly have the capacity to finish them. As I thought I was about to burst from flavor intensity, the waitress brought over a dish that I couldn’t pass up. You see, inside the Brindle Room, there is another business called Wonder City Coffee and Donut Bar. 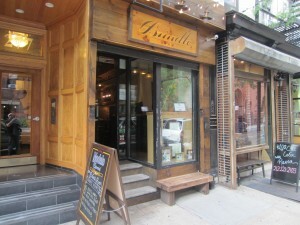 Depending on what time of day you stop by 207 East 10th Street determines which of the restaurants is in operation. 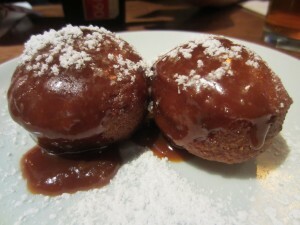 Well, I’m not sure if they had left overs or if the Chef happened to be visiting during our dinner, but we were treated to of their salted Caramel Donut Holes. I’m not much of a a sweets person but after slam dunking this down my throat, I may need to stop back by during the AM hours and see what else is for offer. I hear the Coffee is awesome. If the Coffee and Donuts at Wonder City Coffee and Donut Bar is anything like the delicious Dry Aged Steak Burger at the Brindle Room, then these guys have the kind of place you want to eat at on the way to and from work. The Brindle Room scores a 7 on The Rev Meter. This entry was posted in Bar, Beer, Burgers, East Village, Hamburgers, New York and tagged "brindle room", best burger nyc, burger conquest, cheese, ciancio, east village, East Village, french fries, google offers, hamburger, new york, ny, nyc, rev, review, the rev meter for social community. Bookmark the permalink.